From September 15th to July 1st: Monday to Friday, from 8:00 to 18:00. From July 1st to September 15th: Monday to Friday, from 8:00 to 15:00. Saturdays open from March to August from 12:00 to 14:00. Rest of the year, we open for winery tours upon availability. Check with winery. Sundays/Holidays, open for winery tours every Sunday at 12:00 from March to August. Rest of the year, check availability with winery. Christmas: Open on December 27, 28 from 8:00 to 15:00. December 3rd, 6th and 8th, 24th, 25th and 31st. 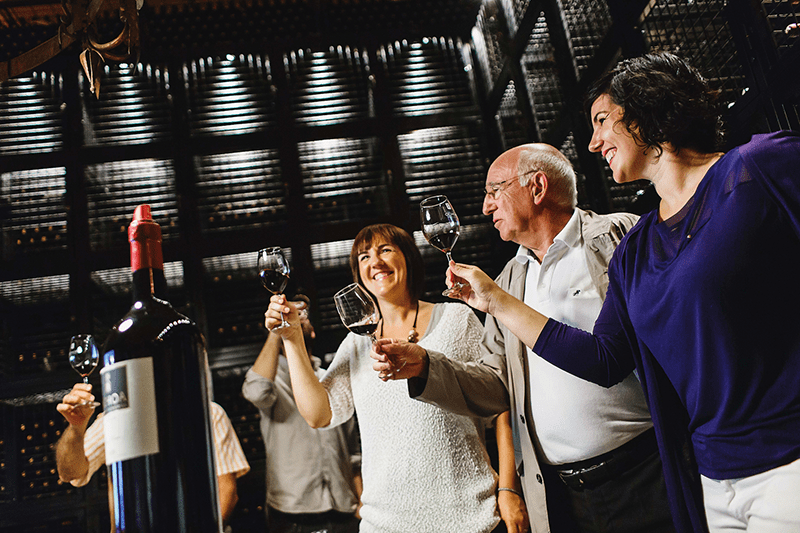 We offer winery tours in Spanish every day (Monday-Sunday) at 12:00h. For other languages, check with the winery. Our staff speaks English and French. Contact us. During spring and summer we also offer winery tours in the evening from Monday to Saturday. Children below 18 years old free entry, always accompanied with an adult. Average duration of the tour and tasting: 1.5 hours. During harvest (September- October) winery tours can suffer changes, cancellations because of works in the winery. We will always inform the customer before the tour. If you are a group of more than 8 people, check with the winery for special conditions. We also offer private winery tours and tastings for small groups (6-12 people) in our Wine Library. Contact us to receive information and book this type of tour. We adapt to your needs.